SEOUL -- The World Baseball Softball Confederation (WBSC) today unveiled the game schedule and named Korean baseball legend Seung-Yuop Lee as Ambassador for Group C of the 2019 WBSC Premier12®, the year's biggest international baseball/National Team event and direct qualifier to the Tokyo 2020 Olympic Games. WBSC President Riccardo Fraccari made the announcements together with Commissioner Chung Un-Chan of the Korea Baseball Organization (KBO), the country's top professional league and Group C host, Korean National Baseball Team manager Kyung-moon Kim and the Korean Baseball Softball Association (KBSA) President Euong-yong Kim at a press conference in the capital. "KBO is ready to host a successful Premier12 competition here in Seoul together with WBSC," KBO Commissioner Chung said. "The Korean National Team has achieved good results on the world stage and is one of the leading countries in baseball, and we wish good luck to our competitors in the group -- Cuba, Australia and Canada -- to perform their best." 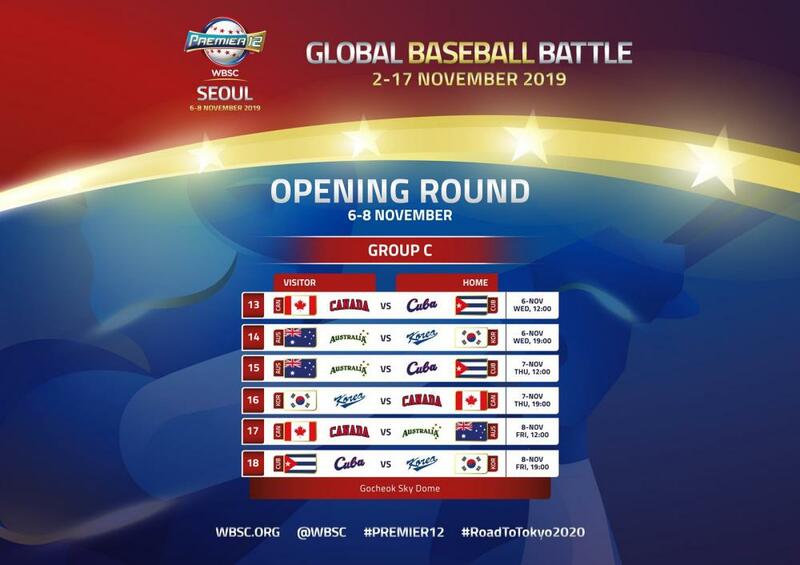 The four teams will play three games over three days, with an all-Americas contest between Canada and Cuba serving as the opener, while Australia will be making the nation's and Oceania's Premier12 debut against host Korea. The top two teams from each group will advance to Japan to compete in the Super Round from 11-16 November, which will be staged at the Tokyo Dome and Chiba's ZOZO Marine Stadium, with the Premier12 Championship Final and bronze medal match to be played at the Tokyo Dome on Sunday the 17th.